Some time ago, I dined on a po’ boy and considered the role of the outpost. If a sandwich is attempting to represent an entire region, I reasoned, being univentive is no great crime. And the folks at the Cheese Steak Shop make it very clear that their sandwich is intended to be just what you might get in Philadelphia. A Bay Area chain, they really stress the authenticity of their food. They go to some lengths in this pursuit, importing the rolls and peppers from Philadelphia. I do not wish to sully sandwich discussion with my own personal thoughts about America’s varied cities, but it seems to me that this kind of misguided but strong provincialism seems exactly Philadelphian. Think about the fact that the rolls are shipped across the country. The roll, while serviceable, was unspectacular. Surely there is a Bay Area bakery capable of producing an acceptable hoagie roll. Sourced locally, it would be bright and fresh when it gets to me. What makes this roll so special? Why is it good? I can imagine the reply: Because it’s from Philadelphia. If aiming to convince me of your quality, this is ultimately a losing strategy. If you’re only going to put one thing on your resume, make it something other than your address. Enough. The sandwich hit the spot on a rainy Saturday. I enjoyed it. But something about it was bothered me, and it wasn’t until I was back out on the street that I figured it out. 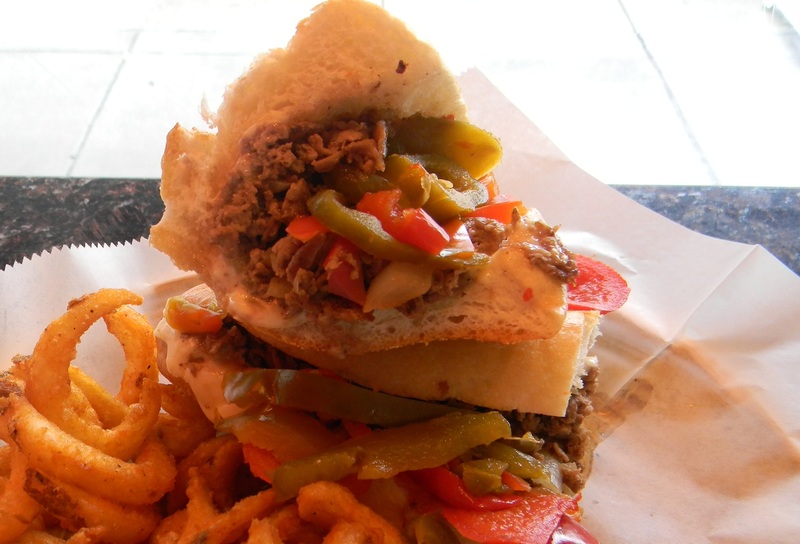 The Cheese Steak Shop understands what a Philly Cheese Steak is: Beef loin is minced beyond recognition, piled in with provolone, onions, and hot & sweet peppers. Grease dripped out as I lifted the sandwich, and the cheese was, at times, a bit much. That is not a complaint, those are hallmarks of the Philly Cheese Steak. In fact, what I came to realize is that it isn’t that the sandwich is needlessly authentic, it’s that it isn’t authentic enough. This entry was posted in Sandwich Reviews and tagged Beef, Cheese, Philadelphia, Reviews by Pete, San Jose by Pete. Bookmark the permalink. I would contend that “provolone” isn’t a word you would use in reference to a Philly cheesesteak, but that’s a debate that rages even in the Philly area I think. If you’re looking for someone to admit that Cheez Wiz is an appropriate part of a sandwich, you’ve come to the wrong blog. THEN I’LL TAKE MY BUSINESS ELSEWHERE. I’m with Mike here; the cheese steak has to be made with Wiz. If you think it’s obscene, then again it fits more into your depiction of the city. In truth I omitted a discussion of Cheez Wiz not out of any charity towards Philadelphia’s reputation, but simply to save myself the ugly labor of contemplation of such horrors.